This pioneering work examines changes in the life and values of the English working class in response to mass media. First published in 1957, it mapped out a new methodology in cultural studies based around interdisciplinarity and a concern with how texts-in this case, mass publications-are stitched into the patterns of lived experience. Mixing personal memoir with social history and cultural critique, The Uses of Literacy anticipates recent interest in modes of cultural analysis that refuse to hide the author behind the mask of objective social scientific technique. In its method and in its rich accumulation of the detail of working-class life, this volume remains useful and absorbing. Hoggart's analysis achieves much of its power through a careful delineation of the complexities of working-class attitudes and its sensitivity to the physical and environmental facts of working-class life. The people he portrays are neither the sentimentalized victims of a culture of deference nor neo-fascist hooligans. Hoggart sees beyond habits to what habits stand for and sees through statements to what the statements really mean. He thus detects the differing pressures of emotion behind idiomatic phrases and ritualistic observances. Through close observation and an emotional empathy deriving, in part, from his own working-class background, Hoggart defines a fairly homogeneous and representative group of working-class people. Against this background may be seen how the various appeals of mass publications and other artifacts of popular culture connect with traditional and commonly accepted attitudes, how they are altering those attitudes, and how they are meeting resistance. Hoggart argues that the appeals made by mass publicists-more insistent, effective, and pervasive than in the past-are moving toward the creation of an undifferentiated mass culture and that the remnants of an authentic urban culture are being destroyed. 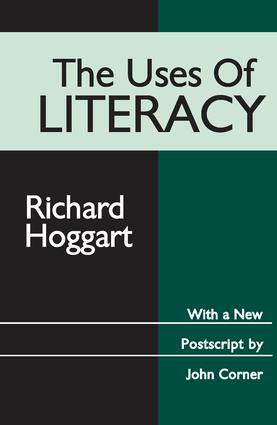 In his introduction to this new edition, Andrew Goodwin, professor of broadcast communications arts at San Francisco State University, defines Hoggart's place among contending schools of English cultural criticism and points out the prescience of his analysis for developments in England over the past thirty years. He notes as well the fruitful links to be made between Hoggart's method and findings and aspects of popular culture in the United States.